湖泊科学 2016, Vol. 28 Issue (1): 163-169. DOI: 10.18307/2016.0119. 温周瑞, 徐军, 谢平, 太湖高等水生植物稳定碳、氮同位素特征. 湖泊科学, 2016, 28(1): 163-169. DOI: 10.18307/2016.0119. WEN Zhourui, XU Jun, XIE Ping. Carbon and nitrogen stable isotopes of macrophytes from Lake Taihu. Journal of Lake Sciences, 2016, 28(1): 163-169. DOI: 10.18307/2016.0119. 作者简介：温周瑞(1966~), 男, 博士, 研究员; E-mail:wenzrui@163.com. 摘要：高等水生植物的稳定碳、氮同位素能够反映其生理生态学信息.从太湖贡湖湾和梅梁湾采集高等水生植物, 分析两湖湾高等水生植物的稳定碳、氮同位素值时空变化和种类差异.结果显示:水生植物的稳定碳、氮同位素值因时间、空间和种类而发生变化, 总体上时间变化规律不明显, 空间变化有一定规律性:梅梁湾中穗花狐尾藻、马来眼子菜、苦草、凤眼莲的δ15N明显高于贡湖湾, 挺水植物芦苇的δ15N差异不显著, 反映了梅梁湾较贡湖湾有较高的营养水平; 贡湖湾中穗花狐尾藻、苦草的δ13C显著高于梅梁湾, 其它种类没有显著差异.从种类特征来看, 贡湖湾和梅梁湾浮叶植物与挺水植物芦苇、凤眼莲、菱的δ13C偏低, 而微齿眼子菜、金鱼藻、马来眼子菜、苦草、伊乐藻、穗花狐尾藻等沉水植物的δ13C值较高, 这与它们所处的环境和碳源有关. Abstract: Nitrogen and carbon stable isotope values can be used to obtain eco-physiological information on macrophytes. This study collected macrophytes at different seasons from Gonghu Bay and Meiliang Bay of Lake Taihu, China to determine the variations of stable isotope values with regard to different season, space and species. The results showed that, with the season, space and species changing, nitrogen and carbon stable isotope values of macrophytes were changed, and the changed values were not obvious with seasonal variation in general, but had certain regularity with the space changes. The nitrogen stable isotopes of Myriophyllum spicatum, Potamogeton malaianus, Vallisneria natans and Eichhornia crassipes in Meiliang Bay were significantly higher than those of Gonghu Bay. 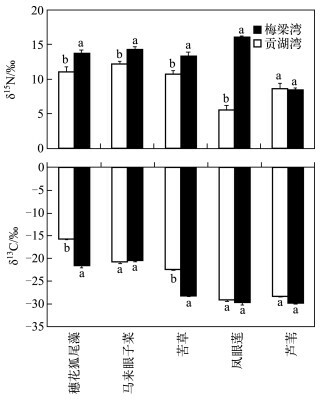 The nitrogen stable isotope from emergent plants of Phragmites communis showed higher level in Meiliang Bay than that in Gonghu Bay. 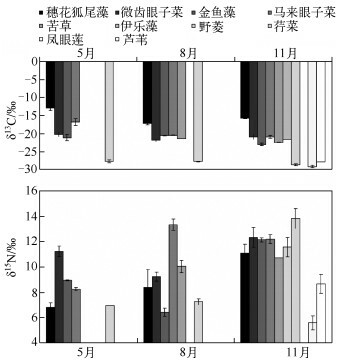 However, the carbon stable isotope values of Myriophyllum spicatum and Vallisneria natans in Gonghu Bay were significantly higher than those in Meiliang Bay, others were not significant in the differences. 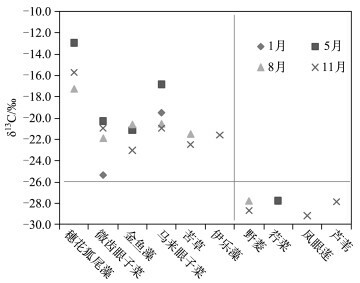 In Gonghu Bay and Meiliang Bay, the carbon stable isotope values of floating plants and emergent plants were lower in Phragmites communis, Eichhornia crassipes and Trapa incise, while Potamogeton maackianus, Ceratophyllum demersum, Potamogeton malaianus, Vallisneria natans, Elodea nuttallii and Myriophyllum spicatum of submerged plants were higher. This might due to the different environments and carbon sources. 太湖(30°5′~32°8′N，119°8′~121°55′E)是中国第3大淡水湖，总面积2338km2，平均水深1.9m.太湖流域高密集的人口和较发达的经济导致大量的生活、农业和工业废物进入湖泊.因此，太湖的水环境质量日益下降，尤其近些年出现了大范围的蓝藻水华.梅梁湾是太湖北部最大的湖湾之一，承接了来自无锡市的污水，因此成为污染最严重的湖湾.贡湖湾在太湖的东北角，同样被人类活动污染比较严重，但是比梅梁湾稍好，还生长一些沉水植物.采样时发现，贡湖湾敞水区分布有微齿眼子菜(Potamogeton maackianus)、马来眼子菜(Potamogeton malaianus)、苦草(Vallisneria natans)、穗花狐尾藻(Myriophyllum spieatum)、金鱼藻(Ceratophyllum demeum)、轮叶黑藻(Hydrilla verticillata)、伊乐藻(Elodea nuttallii)等沉水植物，而梅梁湾几乎没有水生植物生长.因科研项目需要，2003年开始从贡湖湾打捞水草移栽到梅梁湾，在试验区域内形成稳定的水草群落. 共测定10种水生植物，包括穗花狐尾藻、微齿眼子菜、金鱼藻、马来眼子菜、苦草、伊乐藻、野菱(Trapa incisa)、荇菜(Nymphoides peltatum)、凤眼莲(Eichhornia crassipes)和芦苇(Phragmites communis)的稳定碳、氮同位素值，不同水生植物种类之间、不同采样时间和采样点之间的稳定碳、氮同位素值不同(表 2). 调查期间，贡湖湾穗花狐尾藻、微齿眼子菜、马来眼子菜的δ13C 5月最高，8月最低，金鱼藻的δ13C 8月最高，11月最低.穗花狐尾藻的δ13C变化最大，5月为－12.92 ‰ ±0.64 ‰，8月降至－17.25 ‰ ±0.41 ‰，11月升至－15.69 ‰ ±0.12 ‰；其次是马来眼子菜，5月为－16.82 ‰ ±0.96 ‰，8月为－20.53 ‰ ±0.07 ‰，11月为－20.94 ‰ ±0.37 ‰；微齿眼子菜的δ13C 5、8与11月变化不大，分别为－20.26 ‰ ±0.47 ‰、－21.88 ‰ ±0.33 ‰和－20.95 ‰ ±0.66 ‰；金鱼藻的δ13C 5月为－21.14 ‰ ±0.90 ‰，8月为－20.59 ‰ ±0.10 ‰，11月最低，为－23.01 ‰ ±0.29 ‰，与黄亮等报道的梁子湖金鱼藻的δ13C(－21.44 ‰)比较接近；苦草和野菱11月的δ13C值比8月低，苦草的δ13C为－22.49 ‰ ±0.10 ‰ ~－21.48 ‰ ±0.02 ‰，与长湖苦草的δ13C (－22.32 ‰)相近，但野菱比涨渡湖菱的δ13C(－24.29 ‰)偏低(图 1). 本研究中不同生态型植物间δ15N变化范围为5.59 ‰ ~16.14 ‰.在贡湖湾，5月穗花狐尾藻的δ15N最小(6.80 ‰)，8月金鱼藻的δ15N最小(6.43 ‰)，δ15N值最大为马来眼子菜的13.34 ‰，11月凤眼莲的δ15N值最小(5.59 ‰)；在梅梁湾，11月凤眼莲的δ15N最大(16.14 ‰)，最小为芦苇(8.52 ‰). 研究结果显示，水生植物δ13C值随时间、空间和种类的不同存在差异.10种水生植物的δ13C变化范围为－29.91 ‰ ±0.16 ‰ ~－12.92 ‰ ±0.64 ‰，与Keely等报道的水生植物δ13C一般在－50 ‰ ~－11 ‰范围内的结论相吻合. 王兴民, 许秋瑾, 邢晓丽等. 水生高等植物对湖泊生态系统的影响. 山东科学, 2007, 20(2): 29-32. 王文林, 马婷, 李强等. 水生高等植物季相交替群落对富营养化水体净化效果调查. 环境监测管理与技术, 2006, 18(1): 16-19. Barko JW, James WF. Effects of submerged aquatic macrophytes on nutrient dynamics, sedimentation, and resuspension//The structuring role of submerged macrophytes in lakes. New York:Springer, 1998, 197-214. 林清, 王绍令. 沉水植物稳定碳同位素组成及影响因素分析. 生态学报, 2001, 21(5): 806-809. 黄亮, 吴莹, 张经等. 长江中游若干湖泊水生植物体内C、N、P及分布. 地球学报, 2003, 24(6): 515-518. 张润宇, 王立英, 吴丰昌等. 太湖春季沉积物间隙水中磷的分布特征及界面释放的影响. 生态学杂志, 2012, 31(4): 902-907. 蔡德陵. 黄河口区有机碳同位素地球化学研究. 中国科学:B辑, 1993, 23(10): 1105-1113. 温周瑞, 谢平. 太湖梅梁湾、贡湖湾水质与浮游甲壳动物密度季节变化. 长江大学学报:自然科学版, 2013(17): 36-41. Hamilton SK, Lewis WM, Sippel SJ. Energy sources for aquatic animals in the Orinoco River flood plain:evidence from stable isotopes. Oecologia, 1992, 88: 324-330. Tichener RH, Lajtha K. Stable isotopes in ecology and environmental science. New Jersey: Blackwell Publish, 2007. Farquhar GD. On the nature of carbon isotope discrimination in C4 species. Functional Plant Biology, 1983, 10: 205-226. Winter L. Short-term fixation of 14carbon by the submerged aquatic angiosperm Potamogeton pectinatus. Journal of Experimental Botany, 1978, 29(112): 1169-1172. Sand-Jemsen K. Photosynthetic carbon source of stream macrophytes. Journal of Experimental Botany, 1983, 29: 1169-1172. 徐军. 应用碳氮稳定性同位素探讨淡水湖泊的食物网结构和营养级关系[学位论文]. 武汉: 中国科学院水生生物研究所, 2005. Toda H, Uemura Y, Okino T et al. Use of nitrogen stable isotope ratio of periphyton for monitoring nitrogen sources in a river system. Water Science and Technology, 2002, 46: 431-435. Fry B. Stable isotope ecology. New York: Springer, 2006.